Are your Dashboards Telling the Right Story? Not all Dashboards are created equal! They are timely decision-making tools, and users love data visualization, technology, simplicity, and ease of use. However, do dashboards drive the behavior and action that you expect? In this first of three articles, we will share some “lessons learned” about how to design an effective dashboard. If a picture is worth a thousand words, a good dashboard is worth millions! Like a well-placed exit sign on the highway, a dashboard shows you where to go! It tells a quick and simple story and the action you should take. The brain likes to keep things simple, which is why your brain loves pictures over words and numbers. The dashboard is intended to simplify the decision-making process. Designing a dashboard that presents the right images, shapes, and colors may mean the difference in good decision-making. The dashboard presents the story; the graphics reveal the data. It presents the data relevance and coherence. 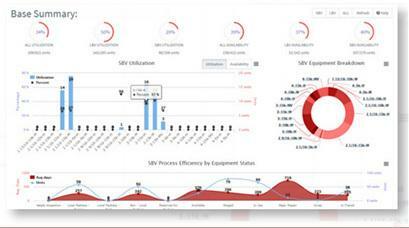 We recently implemented a dashboard for an oil and gas services company. This company leases expensive equipment critical in the fracking process. The revenue of this equipment ranged from $5,000 to $10,000 per day. Their problem was that they could not see what equipment was available to lease to other customers. To find available equipment, they had to search through multiple contracts and leases before they could commit to and schedule new leases. After reviewing their business processes and assessing the data, we proposed a dashboard as the solution. The dashboard presented several infographics of their KPIs. One of the most informative graphics was a Gantt chart reflecting the equipment, location, customer, and lease-end date. Simply by looking at the chart, a sales representative was able to commit the equipment to another customer. He no longer had to look through all of the details. The dashboard helped increase the company’s revenue by over 25% percent through improved equipment availability and reduced downtime. The company improved billing accuracy and reduced back-office costs. The dashboard presented the information in a manner that clarified equipment availability for sales representatives, allowing them to generate more revenue and satisfied customers. The Gantt chart improved the visualization and relevance of the data to support the goals of the field services team. For more information on how Titan’s Dashboard technology could support your business, contact David Geaslen, david@titanconsulting.net, 832.422.3251 or contact your Titan Consulting Director.